-I have been eating BAD!! Cake, chips, M&M's, Starbucks Fraps, non-stop snacking, bad bad bad... I am always hungry and cant stop.. This morning I weighed myself and I was above my comfort threshold. I let myself vary between 180 and 190, although 185 is the weight I have been most often for the last year. Today I was 191!!! UGH!! I am aware of it and will do something about it! -I have no email organization. My Tall Mom Inbox has so many messages that I have not replied to and it give me anxiety. So sorry if you have emailed!! I will try to get back to you when I have some free time. -I make fun of people in my mind. I know this is mean, but I saw the makeup lady on the train again. This time she had maroon eye shadow and her same makeup routine. I should be nice but in my head I was not so nice. I love to people watch and often that turns to internal negative thoughts. -I was hoping that the last Marathon for the Cure Giveaway HEREwould fly, but it FLOPPED!! I am pretty disappointed, but instead of hanging my head I am going to switch it up a bit, so look for the change. The purpose of this Giveaway was to thank those who have donated and inspire others to give to Susan G. Komen Breast Cancer. -I wish I could fast forward to next week because I CANT FOCUS. I am taking a half day on Thursday 6/24 to pick up Marlene HERE and Amanda HERE at the airport. We will go to the Seattle Rock N Roll race expo, eat and maybe go for a short run to shake out the legs. Then Friday is touring the city and a BIG BLOGGER MEET UP!! If you want to join us for dinner on 6/25 and are coming to Seattle Rock N Roll please email me. The Evites have already gone out, but the more the merrier. RSVP ASAP so I know how many to plan for. Those are my confessions.. What do you have to confess today?? I'm laughing at your "make fun of people in my head" confession. We ALL do it, I'm sure. In fact, my friends and I took it a step further a couple of weeks ago. We were at the GOTR 5k and they had this aging aerobics lady leading a warm-up. We found ourselves chatting about her dated outfit, hair, makeup, etc. VERY WRONG but we got caught up. I had to laugh out loud about make up lady.. maroon eyeshadow, really!?!? Holy cow! ICk!!! I confess that I am/have/ will be ingesting too much caffeine today. Ugh. I blame my coworker for the diet soda she brought me and my hubby for the LARGE coffee (I requested a small) he brought me. I sometimes do the "make fun in my mind" thing too. I have been eating birthday cake since Saturday. enough said. I confess that I missed my morning run and now I am frantic to get a run in today. it's so easy to fall back into bad habits with eating. i hate that. then it's so hard to get back on track. but you can, and you will. and i'm betting almost everyone who reads your blog has similiar confessions. :-) none of us are perfect. I will admit that I swear like a salor when I drive! I yell, scream and go nuts with the other drivers! I swear, I am surrounded by idiots who CANNOT DRIVE! See? I'm a little passionate/crazy about it! LOL! Good luck with the eating - you can get back on track quick! Hi! I'm with you on eating bad lately and the make fun of people thing. I think we all do both of those things...I also need to go look at the Running Skirts sale. I've been wanting to try one for awhile now. I confess that I don't really like give-a-ways because I feel like it is too much work for a small chance to win. My loss though. And I confess, I make fun of people in my head too!!! I confess to drinking too much coffee lately. What's up with my 14-month-old waking up at 3:30 all happy and talking? I confess to eating too many ice cream sundae cones. I confess to ordering three skirts at the Running Skirts sale. Now, I can slack off in doing my running attire laundry. I confess that I'm way too excited for my half marathon coming up here in 9 days and I just want to get out there and run some more. Taper is hard! I had two chocolate chip cookies for breakfast. I make fun of people in my mind too. I love to people watch as well and can be pretty cruel with my thoughts... not good! I know all too well about poor food choices lately. Two words: Chinese Buffet. I am so with you with the food. I worked so hard to lose 25 pounds and the past two weeks I have been so bad. Sweet treats, chinese food, cheeseburgers etc...needless to say I now am not feeling so hot so my body must be retaliating. The beauty of making fun of people in your head is that no one has to know, unless you confess:) You must have a good filter to be able to keep it in. As far as e-mail etc...you have been so busy, you will get to it when you can. I confess that I've been eating like crap too! Oh, and I have a CSN stores gift certificate giveaway going on right now. I know you were trying to win one before. And if you wouldn't mind linking me on High Five Friday, that would be great! I spent the day Saturday trying not to say things out loud about people that were walking through the Hy-Vee Triathlon expo. Our nuun booth was right next to the Crustable booth. WTF! People, large people that should not be eating crustables, let alone at a Triathlon were making me crazy. My boss wasn't helping since he was trying to filter himself too! I ate a tootsie roll yesterday. This sounds trivial but the wheat in it made this gluten free girl very very very very....very. cranky. I can't wait til it gets out of my system! Oh man I make fun of people in my head all the time and i really do try to stop but it is really hard!! I make fun of people in my mind - it is pretty normal. I am seeing a nutritionist to help with my bad eating - getting better. I wish I was coming to run the R&R!!! i love it, i think those are all normal things we all struggle with! also, pretty sure my latest confession is plastered all over my blog too! haha. I confess that I've been really slacking on running. I need to discipline myself to get up earlier in the morning so I can run while my little guy is still sleeping. Or get him outside on his scooter or bike to keep me company. Confessions: I got a shake at McDonald's today... a kids size... it was yummy. I haven't had one i a year. I did not run last night and probably won't fit it in tonight either. I SHOP way to much too. I confess that I really have no motivation to cross train or do anything else that requires more effort than running. PS I'm "racing" the Baltimore 10 Miler on Saturday and a Father's Day 5k on Sunday ! I confess that I've been eating horribly too. I keep thinking I'm running it off, but then find an excuse to put off running. Not a good combination! So I'm going to try and view food as fuel instead of comfort, and hit the road a bit more often! PS I'm doing my second 5k this weekend in Portland, Oregon. I'm helping my friend make sure she runs the whole thing. I'm nervous, but excited! i feel like i'm eating ok, but i have been so hungry the last few days!!! eating a lot. Confession...I make fun of others too and make up nick names for them. For example, Dippy Doris for someone I work with. Then I feel bad! I have been slacking on the eating too! Just so many retirement parties and such! I confess that I haven't been eating the greatest either. I think in my head knowing that the RocknRoll is just a little over a week away I'm stocking up on all the fat I'll burn. ha! I need to figure out when to do my packet pick up, too. I don't want to go when it's really busy and I don't want to pay $30 to park because of the Mariner game. Sigh. I confess I've been coasting on my running - not pushing distance or effort. If I see Amanda I am going to give her the biggest hug - her blog along with yours get me through my days & get me out the door to run! Oh man. I can't stop eating either. I'm 6'0 too and put on the 'freshman 10lbs' after my January marathon and trip to seminary in SC. Now, I'm sitting here blogging, stomach is growling, and I'm trying to be good...tis very hard. I WISH I could fit in a size 10-12 but a 14 is more realistic for me now. I make fun of people in my mind sometimes too. Thank goodness I don't end up thinking out loud! Don't worry about what you've been eating. Sometimes, we just need to be "bad". I know that you'll be back to your typical eating habits soon. I confess that I'm way behind in blogging, and I'm a people watcher too. Not to judge, but just observe. - I'm way behind in blog reading. - I "hide" certain people's status updates on FB so that I dont have to read them and be annoyed. - I ate waaaay too much s'mores ice cream the other day. and paid dearly. - today was my first run in 3 days, and only 1 of those days was a scheduled rest. I run so I can eat...thats why I haven't lost as much weight as a person training for a marathon should. Oh well...food is JOY...to me. Can't wait for next week. It's happening...I can't believe it. I too am a tall mom, working on my weight and I was so glad to hear that you allow yourself such a wide range (180-190) and that you said it out loud! When I hear those numbers about me, I get fixated on the how the number sounds and now how I look or feel. You look amazing and I am sure 191 will soon be a thing of the past. My confession? I ate after 8:00 tonight for the first time in over a month and my 1/2 PB&J wasn't even that great. Lame. Thank you! thank you! thank you for saying your weight out loud. 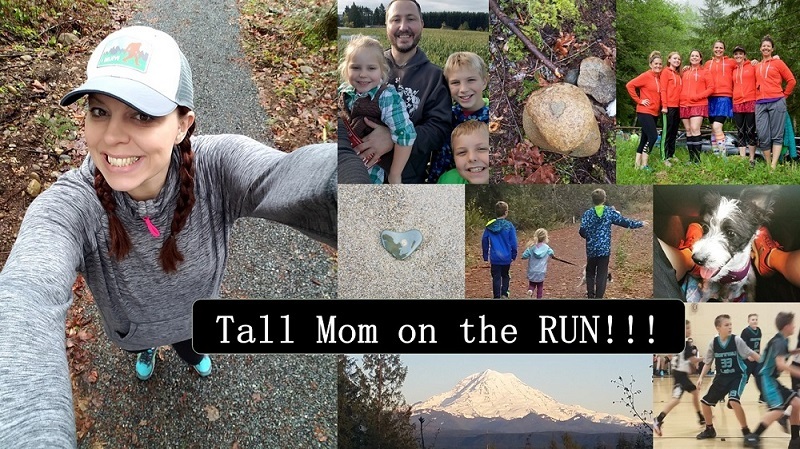 I,like Tortuga_runner and you, am a tall mom. But I have suffered with disordered eating forever so weight is such a "thing" with me. I have been so healthy, eating right, living right but I have no concept of what my body looks like. It helps give me perspective to see how beautiful you are and know that I might look like that too. Make sense? Ha ha I love your post about the whole eating thing. Same issues here. I actually started up on weight watchers. I don't have your height but averager at 5'7. Despite a consistant running schedule, I still manage to gain weight. Even five pounds makes a difference in my runs I am noticing. For me the statement of being able to eat what you want because you run is not true for this body. Not even eating what you want even, just a little over indulging and bam! Up goes the scale. What time are you going to the expo on Thursday? I'm probably going to go that day too since I have a dentist appt Downtown anyway.